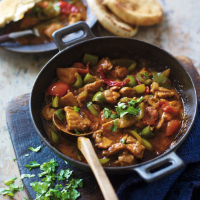 A fabulous family supper - try making this with paneer, prawns or pork in place of the chicken. 1. Heat the oil in a wok and cook the chicken for 3–4 minutes until lightly browned. Add the spices, onion and green peppers and stir-fry for a further 3–4 minutes. 2. Stir in the base sauce, lower the heat and simmer for 2 minutes. 3. Add the main sauce, chicken stock and tomatoes and cook for a further 5 minutes, until the tomatoes are softened but still holding their shape and the chicken is completely cooked through with no pink meat. 4 Divide between 4 serving dishes, scatter over the coriander and serve with naan bread.